One of the very popular applications we do is acid staining concrete. As with many types of various home improvement projects, it appears to be simpler than it actually is. When we first started staining concrete nearly ten years ago, we charged around $2.00 per SF. Most of this was due to understanding the basics but not having the experience. 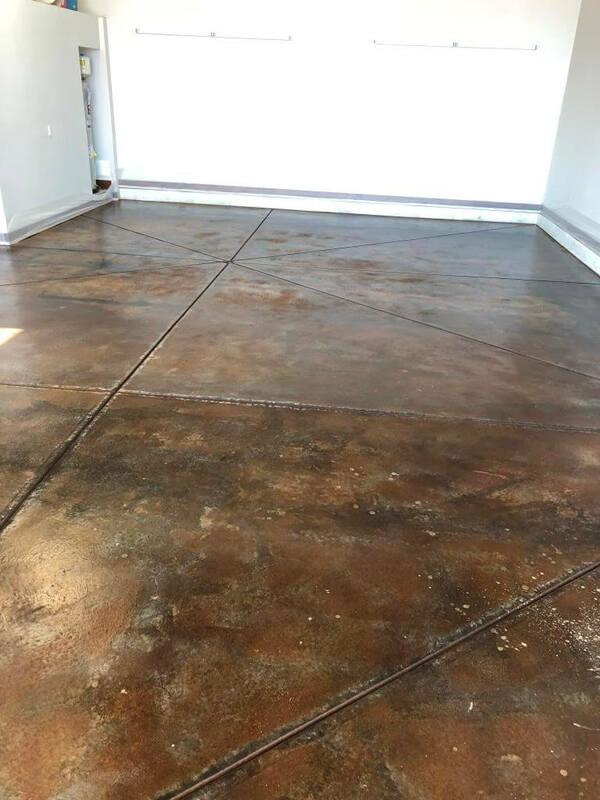 As we’ve stained hundreds of floors, we’ve gained an understanding of the nuances and pros and cons of staining concrete. Today’s price, between $4.00-5.00 per Square Foot, is still very affordable and economical when comparing different flooring options like laminate, tile, hardwood or carpet. One of the common results is depicted in the photos above. The desirable variation of acid staining is seen. In this case, a seemingly clean slab had some sort of chemical spilled on the concrete at some point. More often than not, these spills aren’t noticeable until after the acid stain’s chemical reaction has occurred. As I often say during consultations, it is one of the “risks” of acid staining – we can’t control the chemical reaction. In other words, we don’t necessarily know where or how the acid stain is going to react throughout the floor. This is part of the appeal of this process – the fact that every floor is one-of-a-kind and you get what you get. Of course, there are a couple ways to try to prevent the “flaws” but I’ll save those for another article. Referring to the photos as an example, it would appear to the untrained eye that the acid stain itself was spilled or dripped. This is a common misconception and is an example of what I’ve mentioned above – it simply reacted differently due to a prior contamination of some unknown substance. This project was located in Severance, CO and the colors we used are “Mission Brown” and “Coffee.” We sealed it with a penetrating solvent-based sealer. See the different photos of acid stains we’ve done here to see how they are all very different to each other. As always, if this is something you’re interested in exploring, please reach out and we’d be happy to set up a consultation and/or answer any questions you may have. How Late Is Too Late For Exterior Painting?